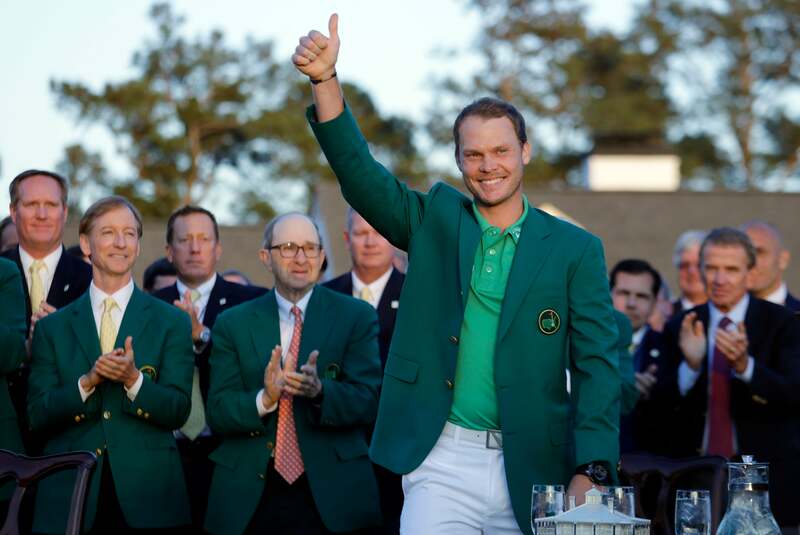 Masters champion Danny Willett, of England, gives a thumbs up after winning the Masters golf tournament Sunday, April 10, 2016, in Augusta, Ga. (AP Photo/Jae C.
Englishman Danny Willett won the Masters this afternoon," a radio announcer in the last row of the press building boomed on Sunday evening. "But trust me, nobody's talking about Danny Willett. They're talking about Jordan Spieth's inexplicable collapse." Yes, I suppose they were, if by "they" he meant the so-called golf experts, like myself, who are paid to cringe when last year's coach-and-horses champion turns into this year's pathetic pumpkin. Spieth's hyper-erratic weekend—which saw him make 12 birdies, six bogeys, two double-bogeys, a quad and possibly a unicorn in a stretch of 36 holes—was more shocking, really, than Rory McIlroy's final-nine self-incineration in 2011. And when you throw in McIlroy's own lost weekend (77 on Saturday) and World No. 1 Jason Day's inability to mount even a semblance of a charge (a final-round 73), it's easy to understand why "they" were ignoring Willett. Except, of course, for yours truly. Writer X tapped me on the shoulder. "Hey, John, got anything you can share on Danny?" Blogger Y rested his arms on the rail above my desk and looked at me with puppy-dog eyes. "I'll take your scraps," he said. "Anything." Webmaster Z, catching me as I stepped outside the building to use my phone, said, "You called it, man! I hope you bet big on Willett." I could have opened a stand and put up a sign: WILLETT BITS, $5 AND UP. To be clear, I didn't pick Willett to win the Masters. All I did was write a 1,200-word feature about him, "Yorkshire Terror," that appeared in a recent edition of Sports Illustrated Golf+. It wasn't even my idea to write about him. In March, an editor with a track record of prescience called me at the Doral Resort, where I had been sent to cover the WGC-Cadillac Championship. He said, "Why don't you write about Danny Willett?" To which I said, "Yeah, O.K." As luck would have it, the Yorkshireman had a very good week, commanding lots of TV time and finishing T-3, along with McIlroy, behind the eventual winner, Adam Scott. I followed Willett for the better part of two rounds and came away impressed. His bunker play was outstanding, his putting was downright brilliant and he went about his business with a crackling intensity. We chatted for a few minutes after each round, and Danny talked so fast, with his cheeky Yorkshire accent, that I couldn't keep up; my notes looked like something written on a roller coaster. Luckily, I ran into NBC's David Feherty in the hotel lobby, and David gave me the money quote. He said, "I think he might be the best thing I've seen out of the U. K. since Rory. He's got a great swing and a great attitude. There's a little evil in him—and I mean that in the best way." The Feherty quote was my template when I wrote that Willett might be "the best thing to come out of Yorkshire since ferret legging." When the story came out, I received a number of texts, tweets, emails and phone calls: Ferret legging? Really?… Spotted typo, assume you meant ‘Fred Leggitt' … Looked it up, LMAO! … Too obscure; write plainly." Ferret legging, I patiently explained, is a sport once popular with north-country coal miners in which competitors vie to see who can keep a ferret in their pants the longest. But here's what struck me. Nobody commented on the subject of my story: Danny Willett, Europe's hottest golfer. He had noisily crept to No. 11 in the World Ranking by finishing third in the 2015 WGC-Cadillac Match Play, forging a T-6 in the Open Championship at St. Andrews, capturing Europe's winning point in the EurAsia Cup, winning the Dubai Desert Classic and pressing McIlroy to the very end in the season-long Race to Dubai. But trust me (see above), nobody was talking about Danny Willett. They were talking about the "Big Three." Not that Willett seemed to mind. He told me at Doral that it suited him to be lurking. "It's nice to be under the radar," he said, "not to be in the limelight all the time." Nevertheless, there was Willett on Sunday, wrecking the radar and hogging the limelight with a bogey-free 67. Spieth, meanwhile, played like a young man with ferrets in his pants. I felt sorry for the Texan, who has been an exemplary champion and an inspiration for young golfers everywhere. On the other hand, I rather enjoyed being—for an hour or two, at least—America's foremost authority on the life and times of Danny Willett, Masters champion. The radio announcer, if you're curious, was gone before Willett slipped on the green jacket. But nobody around me noticed. They were all writing about the champion we should have seen coming.